One of the perks of my day job as a phone interpreter is that with the aid of a hands-free headset I am able to multi-task at work. Just as my character Amparo in The Mango Bride puttered around her kitchen during calls, I regularly fold laundry, knead bread or clean out the kitty litter while translating for various clients. The system worked perfectly for ten years, until last Friday morning. I was attempting to de-seed a cantaloupe half with a large chef knife, while interpreting for a banker and his client. The cantaloupe was heavy and difficult to manipulate, and as I angled the knife around the fruit’s core, the blade slipped and sliced my left pinkie finger just above the top knuckle. It is important to point out that I did not cry out in pain. The only interpreter who’d ever dropped a call in recent memory did so because he’d suffered a heart attack and later died. I am a professional interpreter and simple lacerations do not warrant a dropped call. Instead, I dropped the cantaloupe in the trash, tossed the bloody knife in the sink and ran upstairs to find a bandaid, all the while explaining — rather more stridently than usual — that the Filipina matron needed clarity on several transactions on her bank statement. Still interpreting for the banker and his client, I clamped a cotton ball on the finger, which was now squirting what seemed to be an unreasonably large amount of blood all over the bathroom sink and counter. I pressed a cotton ball atop the offended tip but this was quickly soaked through. Finally finding the bandaids, I wrapped one as tightly possible around the pinky, and sprinted back downstairs in search of ice. Everything I’d ever learned but never needed to practice in First Aid as a Girl Scout was coming back. By then the phone call had ended and with the injured digit wedged between two ice cubes, I considered my options: a) stay home and hope the cut would heal on its own; or b) go to the hospital and get it cleaned up. A trip to the hospital seemed the inevitable choice if only because I’d need a tetanus shot. The only drawback was that I’d have to drive myself to the clinic. Understand that under the best circumstances I am a nervous driver so for just one second I considered calling 911. I held off doing so, since summoning an ambulance for one bleeding pinkie seemed excessive. I called my doctor’s office instead. By some lucky coincidence, my primary care physician happened to have a slot open in the next half hour. Keeping the injured finger above my head — the better to lessen the blood flow to that leaking spigot — I drove one-handed to the clinic in Hillcrest. The wait to see the doctor was mercifully short, but the pre-consultation routine was brutal. Why oh why must you be weighed before you see the doctor? I’d gained four pounds. All things considered, this should have been a minor irritant but it only added to my distress. How many calories in a drop of blood? Hadn’t I dripped a few tablespoons in the last half hour? Didn’t blood loss count for weight loss? The nurse was obviously not privy to my internal monologue, because she delivered the next shocker after unravelling my bandaid. Are you kidding me? I have FAT in my pinkie ? Could it get any worse? Yes, dear Reader, it could. Enter stage left, my primary care physician. Dr. R. is a kindly middle-aged man who resembles best-selling New York Times cookbook author Mark Bittman. Being a Bittman devotee, I took some measure of comfort in the resemblance. The notion of a numbed finger appealed to me. My finger had been suffering hysterics long enough. so apathy sounded like a nice change of pace. Unfortunately the good doctor failed to explain that injecting the numbing medication would hurt nearly as much as dropping a large knife on my hand. The needle he inserted into the base of my pinky felt like a stilletto stabbing bone. Then he did it again on the other side. As he stitched, Dr. R. regaled me with anecdotes about the many times he’d cut himself in the hand while working on his various crafts; how he’d had to suture a large gash on his wife’s foot once without anesthesia; how, if he injured the less dominant hand, he could sew himself back up. I listened with eyes shut and imagined the extra large martini I’d enjoy after all this was over. At the end of this day, I deserved a stiff drink. “There. 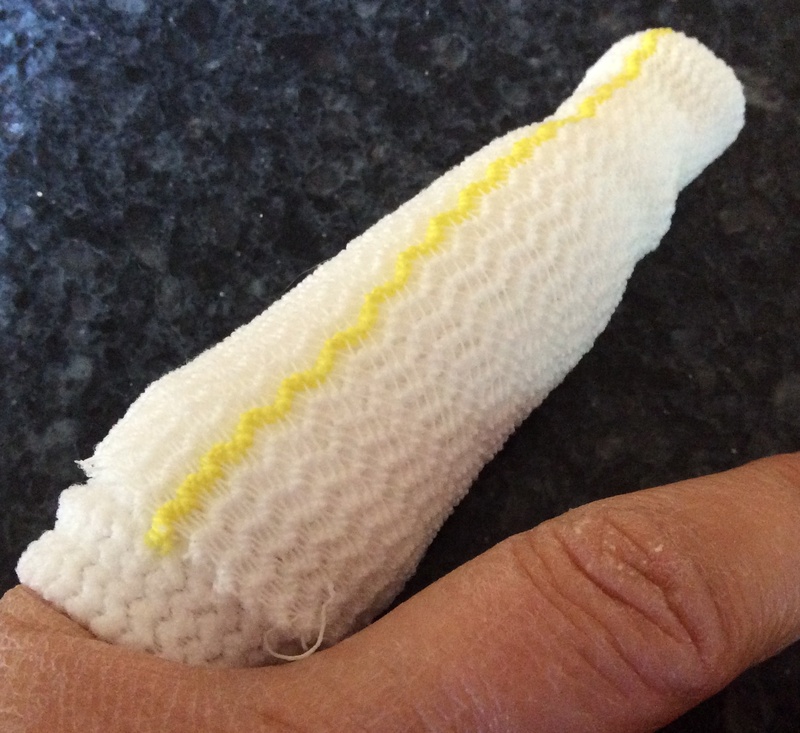 All done.” He released my newly sutured finger. I opened my eyes but fixed my gaze on the poster of cumulus clouds against blue skies on the ceiling. That’s why they put it up there: to give patients something else to look at other than their poor mangled bodies. “So I guess this means I’m off alcohol tonight?” I had no intention of going off alcohol, but wanted to sound like an earnest patient. And that’s when I really began to cry.